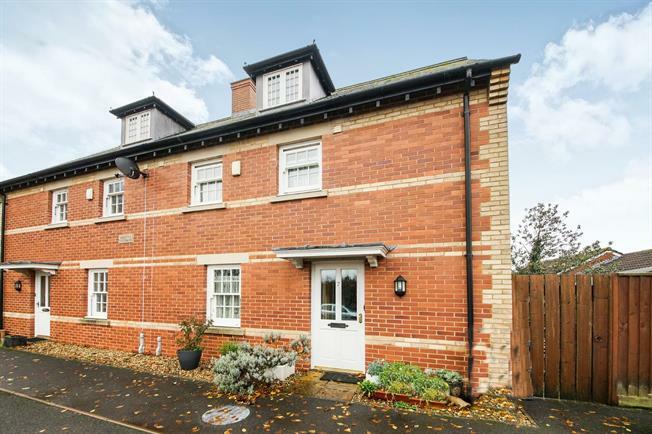 3 Bedroom Semi Detached House For Sale in Templecombe for Asking Price £240,000. A three bedroom, semi detached property, well positioned within the popular village of Templecombe. The accommodation is well maintained and comprises entrance hall, cloakroom, a brilliantly sized living/dining room, large conservatory, modern fitted kitchen, three double bedrooms (with en suite to the master), a family bathroom, whilst also enjoying a well sized, sunny aspect rear garden. The property benefits further from double glazing throughout, garage with parking in front and an economical electrical heating system. Entered via part glazed wooden door, with under stairs cupboard and doors to WC, living/dining room and kitchen respectively. With white ceramic pedestal wash hand basin and low level WC. Fitted with electrical sockets and heater. With French doors leading to rear garden. A modern kitchen presented with tiled flooring and a range of wall mounted and base units with rolled edged work surfaces over. 'Gourmet' electric cooker and hob, stainless steel sink and drainer, and space for washing machine and high level fridge/freezer. Double glazed window to rear. Double room with double glazed window to rear and radiator. Suite comprising Walk in shower, white ceramic pedestal wash hand basin, and low level WC. Double glazed window to front and radiator. Suite comprising Panelled bath with shower over, white ceramic pedestal wash hand basin and low level WC. Double glazed window to front and radiator. Double room with double glazed window to rear and radiator. Velux window and eaves storage.